Lukic, Rénéo; Lynch, Allen (1996). Europe From the Balkans to the Urals: The Disintegration of Yugoslavia and the Soviet Union. Oxford University Press. ISBN 0-19-829200-7. Magaš, Branka; Žanić, Ivo (2001). 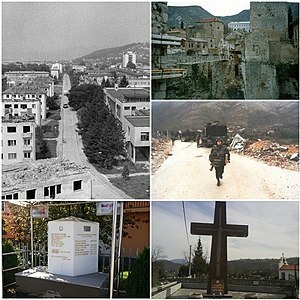 The War in Croatia and Bosnia-Herzegovina 1991–1995. Taylor & Francis. ISBN 0-7146-5204-0. Ramet, Sabrina P. (2002). Balkan Babel: The Disintegration of Yugoslavia from the Death of Tito to the Fall of Milošević. Westview Press. ISBN 0-8133-3987-1. Central Intelligence Agency, Office of Russian and European Analysis (2002). Balkan Battlegrounds: A Military History of the Yugoslav Conflict, 1990–1995, Volume 1. Washington, D.C.: Central Intelligence Agency. ISBN 978-0-16-066472-4. Central Intelligence Agency, Office of Russian and European Analysis (2002). Balkan Battlegrounds: A Military History of the Yugoslav Conflict, 1990–1995, Volume 2. Washington, D.C.: Central Intelligence Agency. ISBN 978-0-16-066472-4. Tanner, Marcus (2001). Croatia: a nation forged in war (2nd ed.). New Haven; London: Yale University Press. ISBN 0-300-09125-7. "Prosecutor v. Kordić and Čerkez Judgement" (PDF). International Criminal Tribunal for the former Yugoslavia. 26 February 2001. "Prosecutor v. Rasim Delić Judgement" (PDF). International Criminal Tribunal for the former Yugoslavia. 15 September 2008. "Prosecutor v. Jadranko Prlić, Bruno Stojić, Slobodan Praljak, Milivoj Petković, Valentin Ćorić, Berislav Pušić - Judgement - Volume 1 of 6" (PDF). International Criminal Tribunal for the former Yugoslavia. 29 May 2013. หน้านี้แก้ไขล่าสุดเมื่อวันที่ 8 ตุลาคม 2561 เวลา 11:49 น.